Identification: Long tails. Upperside is dark blackish brown; body and wing bases are iridescent blue-green. Males have a costal fold enclosing scent scales on the forewing. 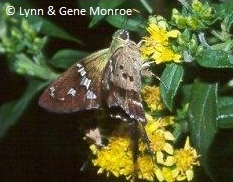 Dark row on hindwing underside consists of separate spots. Wing Span: 1 3/8 - 1 5/8 inches (3.5 - 4.2 cm). Life History: Eggs are laid on young leaves of the host plant, which caterpillars eat. Flight: Many flights from April-October in Mexico; August in South Texas. Caterpillar Hosts: Beggar\'s ticks (Desmodium). Habitat: Open subtropical woods and edges. Range: Brazil and Paraguay north through the tropics to Mexico. A rare stray north to the lower Rio Grande Valley, Texas. Conservation: Not necessary for a rare stray.